Dixie Guerrero, widow of photographer Pedro Guerrero, accepting the Julius Schulman award on Sunday, June 9, at the Gores Pavilion, in New Canaan, Conn. When Pedro Guerrero died in September 2012 at age 95, New Canaan, and the nation, lost one of the foremost figures and documenters of the midcentury modernist movement. Roughly 40 of New Canaan's modern art aficionados congregated within the glass walls of the Gores Pavilion in New Canaan Sunday for the opening of "Pedro E. Guerrero: Photographs of Modern Life," a joint presentation of the Julius Shulman Institute at Burbank, Calif.'s Woodbury University and the New Canaan Historical Society. 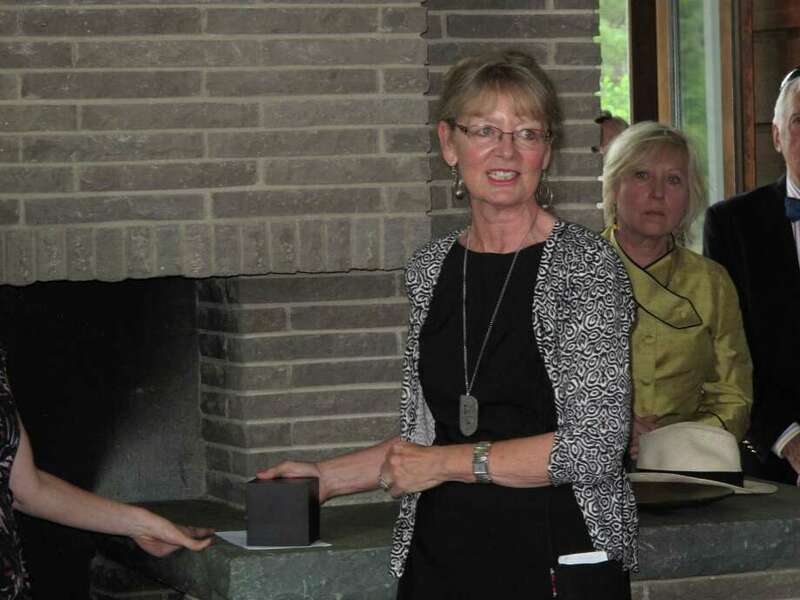 Emily Bills, the managing director of the Shulman Institute and curator of the exhibit, presented the 2012 Julius Shulman Institute Excellence in Photography Award to Guerrero's widow, Dixie. Several notable people were also in attendance, including several of Guerrero's children and grandchildren, renowned furniture designer Jens Risom and Pam Gores, the widow of modern architect Landis Gores. A photo of the building also is in the Guerrero exhibition. Guerrero was a renowned midcentury photographer known best for his photographs of modern architecture. He was first hired by, and later became close friends with, Frank Lloyd Wright, photographing many of his buildings. A resident of New Canaan for most of his life, Guerrero was associated with many of New Canaan's Harvard Five modern architects, such as Gores, Marcel Breuer and Philip Johnson. "As we all know, Pedro, who charmed us all, passed away in September," Bills said in her award presentation remarks. "I know it would have meant a lot to Pedro to have his work here. ... It is my honor to extend the 2012 Julius Schulman award posthumously to Guerrero. Dixie, this is for Pedro, and for you." Dixie Guerrero graciously thanked the Julius Schulman Institute and the New Canaan Historical Society for the award. "I know what he would've said: `What took you so long?' " she said to laughs from the room, before discussing her late husband's work. "What made his photographs so unique is the humanity his photographs brought out. He loved humanity, he loved life, and that came through in his work." In both wings of the Gores Pavilion, black-and- white photographs of some of New Canaan's and the nation's finest modernist architecture were displayed. In one wing was the Guerrero exhibit, and in the other, an exhibit called "Architects Revisited: A Second Look at New Canaan's Architects 1953-1983." Guerrero also had a photograph in that collection. Guerrero was "one of the greatest," Bills said. "The majority (of the photos) are silver gelatin prints," he said after the ceremony, referencing the older method of developing photographs, which was superceded by color photography in the 1960s. "He went into the darkroom, which is very special for a photographer, and he was in his 90s. Most of his work is of Frank Lloyd Wright, but most of these are of houses from Connecticut and are works which have never been seen before." Guerrero had help in the darkroom from Dixie, who also served as his assistant. The pair worked at their home in Arizona, where Guerrero moved in the 1990s from New Canaan. "It's always important when a photographer prints his own work," Dixie Guerrero said. "There are always different tones and details he wants to bring out. We worked very closely together."